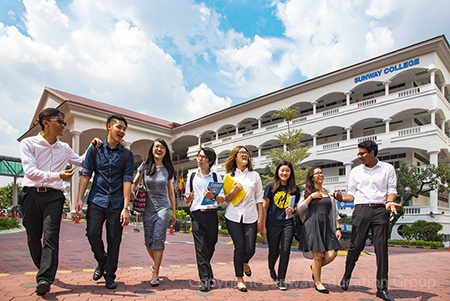 The Pre-University Studies at Sunway College focuses on delivering university preparatory programmes to equip students with critical thinking and independent learning skills, preparing them for admissions into premier universities all over the world. Experienced and committed in working with students, the lecturers and the teaching-learning approaches bring out students’ best academic performance and leadership attributes. 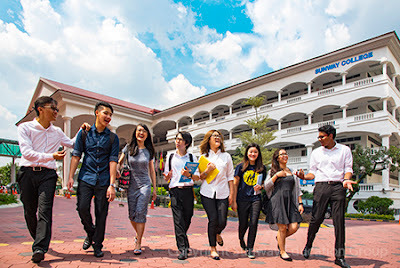 One of the main unique aspects of the Sunway College pre-university studies experience is the focus on a holistic approach to students’ academic and personal development. Students’ success stories in fields of studies like medicine, science, engineering, accounting, business and arts, are testimonies of the high degree of pastoral care and academic guidance offered during the course of their studies at Sunway. Sunway College offers six internationally recognised pre-university programmes tailored to suit the individual students’ academic pathway. The programmes are the Australian Matriculation (AUSMAT) programme, Cambridge GCE A-Level, the Canadian International Matriculation Programme (CIMP), Monash University Foundation Year (MUFY), Sunway Foundation in Arts (FIA), and the Sunway Foundation in Science and Technology (FIST). 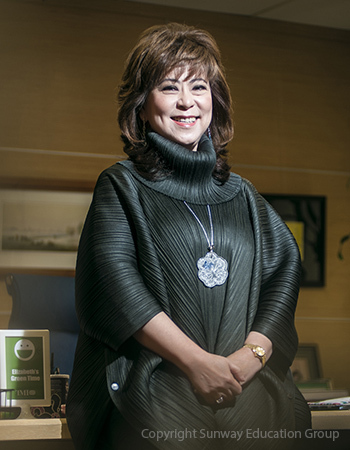 “Our pre-university programmes are well known for nurturing well rounded students who excel not only in their studies”, said Dr Elizabeth Lee, Senior Executive Director of the Sunway Education Group and Sunway University. “Here we offer more than just an academic qualification. We strive to educate them, to prepare them for life and to encourage them as we do through leading by example to contribute back to society. We aim to provide them an experience in various areas of personal development, responsibility and cultivate the desire to make meaningful contributions to their community and society, for we believe these are part of what a well-rounded higher education should be”, explains Dr Lee. Sunway College through Sunway TES Centre for Accountancy Excellence (CAE) plays a vital role in the growth and process of the accounting profession in Malaysia. With the advantage of experienced and dedicated staff, both academic and administrative, the Sunway TES CAE has achieved significant progress. It holds a significant track record for nurturing Malaysia and World Prize winners for Association of Chartered Certified Accountants (ACCA), top scorers in Certified Accounting Technician (CAT) and Institute of Chartered Accountants in England & Wales (ICAEW) examinations, demonstrating a commitment and ability in matching global standards in accounting studies. In September this year, Sunway TES CAE was appointed as CPA Australia’s Registered Tuition Provider. In 2014, it celebrated its 10-year partnership with ICAEW and the year before its “10 Years Association of Chartered Certified Accountants (ACCA) Platinum Award”. The Platinum status is the highest accreditation awarded by ACCA in recognition of the high quality tuition and support offered to CAT and ACCA students. Asides from pre-university and professional accounting programmes, Sunway College also offers undergraduate twinning degree and MBA programme with Victoria University, Australia. The partnership with Victoria University (VU) spanning 20 years sees the VU Bachelor of Business degree programme as the longest standing twinning programme in the country. “From just 40 students when it started out, today we have more than 2,200 VU Bachelor of Business graduates and more than 400 VU MBA graduates”, said Dr Lee. “Tan Sri Dr Jeffrey Cheah, our Founding Trustee of the Jeffrey Cheah Foundation and Chairman of the Sunway Group, first established the programmes back in the nineties to help provide Malaysian students an opportunity to obtain a highly accredited foreign university degree while forgoing the high cost of living overseas. With the current state of things, we hope once again to be able to cater to young Malaysians who wish to obtain international accredited foreign university degrees right here in this country”, added Dr Lee. “And one of the plus points of studying at Sunway College are the many international events and conferences held here in Sunway itself where students have the opportunity to attend or learn practical skills as student helpers. In line with Tan Sri Dr Cheah’s vision to partner some of the world’s leading institutions in bringing world-class learning experience and impactful leaders to Malaysia, Sunway has so far organised or played host to many international conferences, forums and events. Just this year alone, the events we have had here include the world’s largest annual conference on Southeast Asia, the Oxford’s 4th Southeast Asian Studies Symposium, held outside the University of Oxford and in Malaysia for the first time; the Harvard Asia Leadership Winter and Summer Trek; the Harvard Krokodiloes Musical World Tour and the Global Access to Post-Secondary Education (GAPS) Conference,” Dr Lee explains. “Next year, they will be more. After hosting the Asia Leadership Trek for 2 successful years, Sunway now partners the Harvard University Asia Centre by having the Center for Asia Leadership based here on campus. Sunway College students can look forward to assist or attend the Asia Leadership Conference and the Asia Leadership Youth (ALY) Camp next year. The ALY Camp which was held for the very first time this year during the summer trek received such good feedback that we are planning another one. There will definitely be more interesting and exciting opportunities in store for our students next year. “Asides from textbook and out-of-the classroom learning, Sunway College students are encouraged to participate in experiential learning. Sunway is currently the first Malaysian educational institution to support Dialogue in the Dark, a social enterprise established 25 years ago in Germany. While extending help to Dialogue in the Dark, having them here on campus provides ample opportunity for students to gain greater exposure and better understanding by a personal experience beyond sight, learn to empathise, and along the way pick up other skills such as communication and leadership,” emphasized Dr Lee. In the international Student Barometer Survey Entry Wave 2014 undertaken by i-graduate, the Sunway Education Group including Sunway College achieved high student satisfaction for graduate employment. It was ranked No. 1 in Asia for ‘Employability’, highest out of 15 Asian institutions. Sunway College received 6 stars in the college-based rating and general programmes cluster in MyQUEST 2014/2015, further proving itself as a leading learning institution in Malaysia. The Malaysian Quality Evaluation System for Private Colleges (MyQUEST) is one of many prestigious and not-to-be-missed ratings for Malaysian private colleges. Sunway College has indeed come a long way since its setup in 1987. Formed by Tan Sri Dr Jeffrey Cheah with the belief and understanding that higher education is vital to the progress of the country, this belief and understanding still holds true to this day. Sunway College, together with 12 other institutions under the Sunway Education Group, is owned and governed by the Jeffrey Cheah Foundation (JCF), Malaysia’s largest education-focused social enterprise. The JCF is imbued with the philanthropy of nurturing success and transforming lives through education. The Foundation made history this year with a disbursement of scholarships worth RM45 million to more than 3,000 students surpassing last year’s RM33 million, bringing the total amount of scholarships awarded to date, to more than RM210 million to over 23,000 students. Opportunities abound for recipients, Tan Sri Jeffrey Cheah believes education leads to better future and lives for the recipients and also for our nation.